Help your family move more each day and have fun with it. Think about what your family can do to be active together. Here are some ideas. Identify free times. Keep track of your daily activities for one week. Pick two 30-minute time slots you could use for family activity time. Add physical activity to your daily routine. For example, walk or ride your bike to work or a friend's house, walk the dog with your children, exercise while you watch TV, or park farther away from your destination. Try to walk, jog, or swim during your lunch hour, or take fitness breaks instead of coffee breaks. Try doing something active after dinner with your family, or on weekends. Check out activities requiring little time. Try walking, jogging, or stair climbing. Ask friends and family to support your efforts. Invite them to be active with you. Set up a party or other social event with activities that get people moving, like dancing or having a jump rope contest. Play with your kids or ask them to join you for an exercise video or fitness game. Plan to be active at times in the day or week when you feel you have a lot of energy. Convince yourself that if you give it a chance, physical activity will increase your energy level—then try it. Plan ahead. 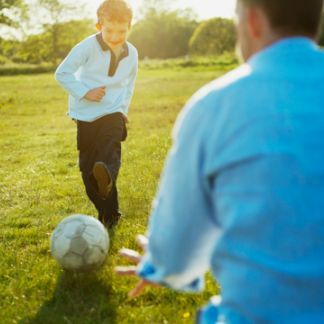 Make physical activity a regular part of your family's schedule. Write it on a family activity calendar. Join an exercise group or class. Sign your children up for community sports teams or lessons. Pick activities requiring no new skills, such as walking or climbing stairs. Exercise with friends who are at the same skill level as you are. Create opportunities for your children to be active with friends. Find a friend who can teach you new skills. Take a class to develop new skills and enroll your children in classes too, such as swimming, dancing, or tennis. Select activities that don't need costly sports gear, such as walking, jogging, jumping rope, or doing push-ups. Identify cheap, local resources in your area, such as programs through your community center, park or recreation group, or worksite. Develop a set of activities for you and your family that are always available regardless of weather, such as indoor cycling, indoor swimming, stair climbing, rope skipping, mall walking, dancing, and active games that you can play indoors. When the weather is nice, try outdoor swimming, jogging, walking, or tennis. Adapted from: "Overcoming Barriers to Physical Activity? [external link] " Centers for Disease Control and Prevention's Division of Nutrition and Physical Activity.